Unlike the game rules and strategies, many players are familiar with the insurance the game offers them. For those who are not, insurance is a side bet and it can be taken only if the dealer’s up card is an ace. It is separate from the rest of the players’ bets and its purpose as the name hints is to prevent players from the worst case scenario which is the chance that the dealer is dealt blackjack. In order to insure their hand, players need to wager equal to half of their initial bet placed next to their cards in the section labelled as insurance. Players can take advantage of the insurance straight after they receive their first two cards and as already mentioned, the up card of the dealer needs to be an ace. During this stage is the time when the dealer will ask whether any of the players would like insurance. Thus, every gambler should consider such a situation very carefully in advance in order to be as prepared as possible for it. Knowing that the ace can be valued as one or eleven, it gives players the amazing opportunity to be as flexible as they need to be. Moreover, if players have this powerful card and aim at having blackjack, they’re halfway there. If gamblers are lucky enough to get a hand with ace-10, they cannot go wrong. This position is one of the most advantageous ones in the game which is the reason why players need to make the most of it while they can. In case gamblers have blackjack, it is highly recommendable for them to take advantage of the insurance the casino offers as this guarantees them they will win the money of their initial bet. In order to clarify the above mentioned situation, let’s have a look at the following example. If the dealer’s up card is an ace and the players have a hand with blackjack, then they are in a very tricky situation because if the hole card turns out to have a 10 value, the players and the dealer will end up having the same hand. This is the worst case scenario for gamblers as initially it puts them in a great position but in the next moment their stroke of luck turns out to be pointless. Player is dealt a 15 Hand. Dealer’s Up card is an Ace. Player has the opportunity to place an insurance. As Blackjack is a casino game, the whole gambling process consists of making the right choices throughout the game. Every action players take is bound to be a correct or an incorrect one and there is no guarantee for the success of their moves, except for when players get insurance. If they take the decision to insure their hand if it is blackjack, the final result is always guaranteed – they will get a profit which equals their initial bet, no matter whether the dealer will end up with a blackjack or not. When players are dealt with a blackjack and the dealer’s up card is an ace, there are two outcomes of this situation – the dealer will either have a blackjack or not. Let’s have a look at both possible cases in order to find out which is more beneficial for players if they got insurance. First possibility is when the dealer doesn’t get blackjack. In this case players lose the insurance bet which is $5 but for having a blackjack they will get paid 3/2. And the other possible situation – if the dealer has blackjack too, players get paid for their insurance 2/1. Bearing in mind the following examples, it is recommended that players take insurance for their blackjack as this is a really favourable position to be in and shouldn’t be wasted. The odds and probabilities in such a situation work in favour of the players and it is a case in which their profit is actually guaranteed. After all this is gambling and any occasion that guarantees players a certain profit is to be considered priceless. 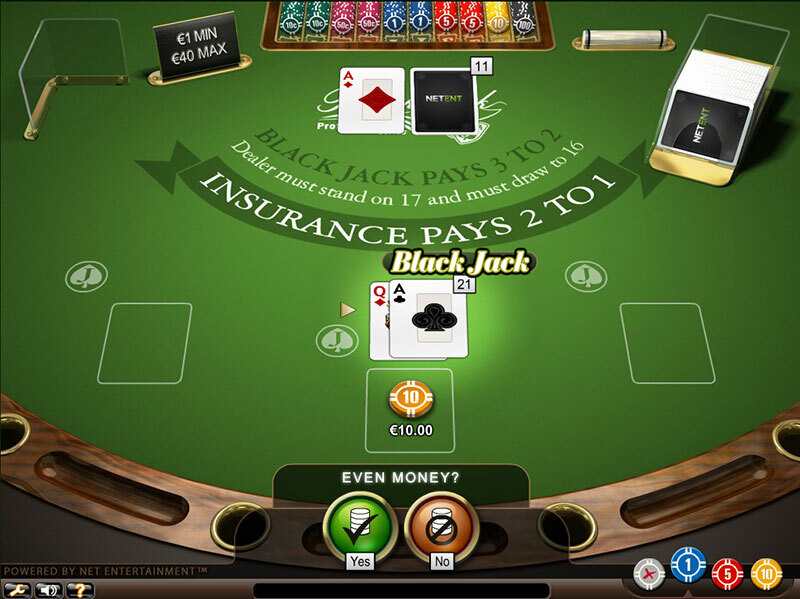 Player is dealt with a Blackjack. Dealer’s Up card is an Ace. Player has the opportunity to place an even money insurance. Additionally, a few more important things need to be taken into account – the number of the included decks and the cards that are about to be dealt. Even though many advanced gamblers will advise new players to take insurance only when the dealer has an ace as an up card, there have been discussion regarding this matter. Some players who use the card counting strategy, point out that in case there aren’t many 10 values cards left in the deck and they have 20, they will have insurance on their hand. Their logic is based on the fact that the dear is most unlikely to have a 10 in such a deck. Of course this explanation sounds reasonable enough and after all the choice is up entirely to the players. Many professional gamblers would not take such a chance and stick up to the insurance of blackjack only. The question whether to get insurance or not is very delicate and just like any other choice when it comes to gambling is quite hard. This is the reason why it is advisable for players to make up their mind in advance so that in case they face such a situation, they will know how to proceed. Gamblers should think this matter through and decide for themselves what is best. The professional opinion of many of them is to insure only a hand with blackjack and get the guaranteed profit. Before players make up their mind regarding the insurance, they need to take into account the above mentioned reasons and advices. If players find out about insurance only after they sit on the table, this places them in a disadvantageous position as they need to make their decision quicker. When people are exposed to a stressful situation, the chances that they won’t be able to act accordingly are quite high. It is recommended players to be as prepared as possible before they start the game, if their aim is to win.